Boston Closets is a family-owned home organization company that specializes in the design and installation of custom walk-in closet organizers in homes throughout Massachusetts. We have more than three decades of experience designing closet organization solutions for spaces of all shapes and sizes. There are possibilities for an affordable, functional and beautiful walk-in closet design. Create the dream walk-in closet you’ve always wanted and house your entire wardrobe with room for accessories, shoes and even more clothes! Make the most of your unused and available space with a range of Boston Closet design options, including shelving, cabinets and drawers. We work closely with homeowners to discuss their ideas in detail during a free, no-obligation consultation right in their home. This process lets us see the space we will be working with, take measurements, and offer expert advice. Unlike other walk-in closet designers in the area, we are not a franchise. Our only goal is to provide closet organization solutions for every space in your Boston home. Are you tired of digging through clothes hangers that hang so close together that you can barely distinguish one garment from another? Are you sick of clothes that get crumpled from being crammed into drawers? Are your shoes thrown into piles because of a lack of space? Do your accessories take time to untangle before usage because they’re all thrown into an overflowing drawer or jewelry box? 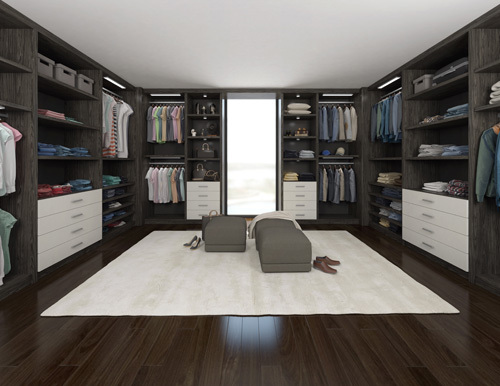 Match any décor scheme while getting organized and reducing clutter with our custom closet storage systems created exclusively for homes in Boston and throughout Massachusetts. Contact our team today for a free, no-obligation in-home consultation to discuss your walk-in closet and home storage needs!